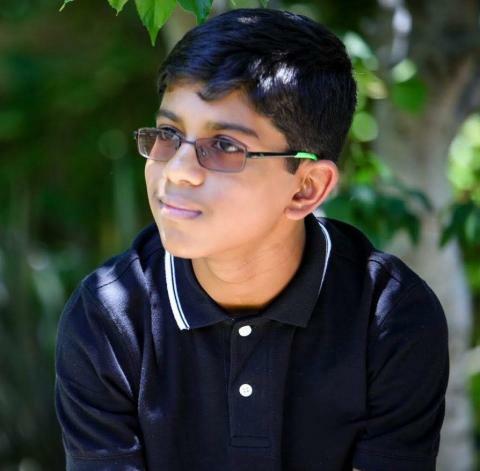 Tejas Mathai was born on in November 2005 in Turlock, California. He currently lives in Modesto, California, with his family. He has grown a huge fascination for Star Wars over the years. He started writing stories when he was 6 years old and still does today. Infinity: The Secret of the Diamonds is his debut science fiction novel. Joining LitPick for Six Minutes with an Author is Tejas Mathai, author of Infinity: The Secret of the Diamonds. A lover of Star Wars, Tejas has been writing since he was six. Now a teenager, Infinity: The Secret of the Diamonds is his first science fiction novel, and he is donating the proceeds from the purchase of this book. I started writing when I was in second grade, and I wrote mostly in short story format. The movies and books I enjoyed inspired me to write. The stories I wrote would include my younger brother and me going on imaginary adventures like time travel and space travel. My younger brother influenced me to start writing. In addition to all the other influences like movies and books, the two of us would use toys/action figures and Lego characters to act out stories, which we would get lost in for hours. He was a major part in the making of my first book. My favorite book is the Harry Potter book series. I started this series in July of 2016 and finished it in August of 2016. It also had a major influence on the characters and plot of my current book. My advice to anyone who wants to be an author is that it takes a very long time to perfect the plot of your story. For example, I first thought of my current book in 2014, and it has taken 4 years to fine-tune and alter the plot lines. Also, take your time and put the details in your writing. This will help paint a picture in the reader's mind. My favorite place to write is in my living room, when it is only me or one other person in the area. It is usually a quiet space or I have my song playlist playing in the background as I write. Whenever there are more than two people, I feel like I cannot concentrate as well as I would with less people. I hope many people get to read my book and provide me with feedback and reviews. The proceeds made from this book will be donated to a local children's hospital. I also want to encourage other kids to read, write, and follow their passions as one may never know their potential. No dream is too small to fulfill. Lastly, I wish all future authors the best of luck. Tejas, thank you for joining us for an author interview. We love your advice about following your passion. You are an inspiration, and you show others that you’re never too young become an author. Best of luck to you as you continue on your writing journey. We look forward to sharing more of your books in the future.